An old boarded-up shed on my parents' farm contained what was left of my Grandad's bakery. I used to love exploring old sheds when I was young. I had previously considered this shed inaccessible, but about thirty years ago managed to find a way in and slithered through the small gaps between the tightly-packed furniture, eventually discovering some wooden chess pieces in a drawer. I've had them with me ever since. I lost a pawn from the set under the house that Davina and I were living in about twenty years ago. Our cat Malamba (or Malamber, as Davina insists it should be spelt) had a litter of kittens, and one of them knocked the pawn down a hole in the floor of the old house. So, for a while, the set was one pawn down. The set remained incomplete until maybe a couple of years later - I forget how long now - when I was sitting down to a game of chess with my mate Evan at Chez Eelco, the cafe that used to be at the top of Trafalgar Street in Nelson. The cafe had a mismatched set of chess pieces. As soon as I picked up a pawn with a sudden intake of breath, I looked at Evan and he said, "Say no more, mate, say no more," understanding me completely - it matched my lost one, and I quietly slipped the pawn into the pocket of my jeans. The mismatched set still had enough pawns to make a full set and then some, so I didn't feel too bad about taking the piece. 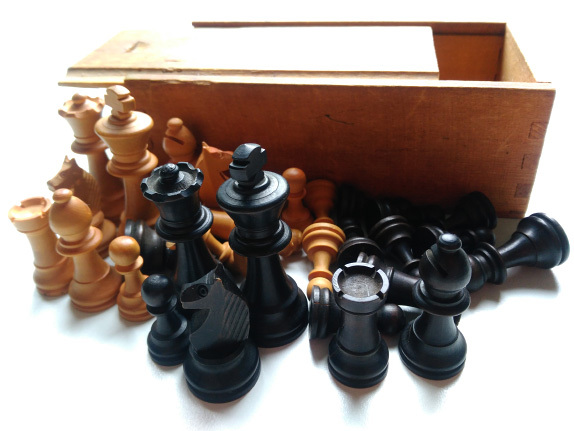 A storm destroyed the old shed at some point through the years, so I'm glad I found and rescued the chess pieces when I had the chance. Interesting points, for sure. A lot has changed in the world in the 50/60 years since they must've been made! So much has changed since he first game of chess 1500 years ago - and most of the changes have happened durng he lifetime of those chess pieces. Another very perceptive comment, Rich!